Would you like ongoing refreshment for your creative journey? Feel free to become an Art and Soulie! who receive inspiration and updates on offerings roughly every 10 days via the Art and Soul newsletter. Mostly the workshops, playshops, Creativity Coaching and Creative Purpose Coaching happen in person around Sydney, Australia, but email or Skype creative support are possible too. Join Art and Soul newsletter? 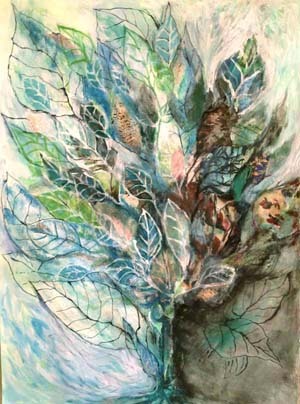 Began with simple tearing and arranging of collage leaf shapes when I was ill with flu. Soothing. Then painting to fill out the Delicatree. Then fine felt pen delineation of leaves. Hope you enjoy looking as much as I enjoyed doing.